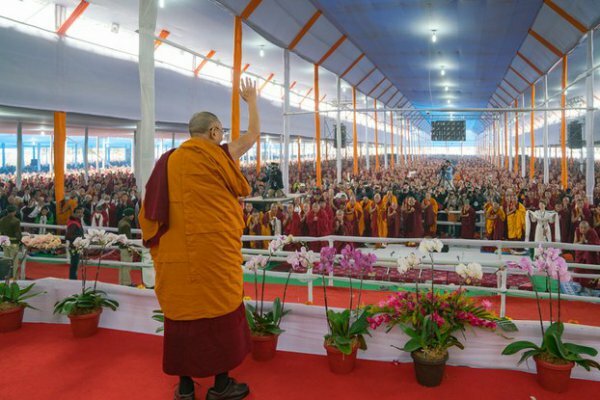 Almost 7,000 Tibetan devotees were hindered to take part in the Buddhist ritual of Kalachakra led by the Dalai Lama and attended by over 100,000 disciples, from 11 to 13 January 2017 at Bodh Gaya in northern India. Since November 2016, Chinese authorities have been confiscating passports and issued orders to Tibetans in Nepal and India to return home, threatening to harm their family members in Tibet if they did not comply. Nearly 7,000 Tibetans hoping to attend a major Buddhist ritual in India led by exiled spiritual leader the Dalai Lama have been barred by Chinese authorities from taking part in the event, ceremony organizers told reporters on Wednesday [5 January 2017]. More than 100,000 devotees from around the world have now assembled in Bodh Gaya, India—site of the enlightenment of the historical Buddha—to participate in this year’s  Kalachakra empowerment, which is set to run from Jan. 11 to 13, with preparatory teachings and other events already under way. Thousands of pilgrims from Tibetan-populated areas of western China who had hoped to attend have been forced to return home, though, while others have been blocked from leaving China, event organizers Karma Gelek Yuthok and Kalon Choekyong Wangchuk said. “It is extremely unfortunate and sad that so many Tibetans who wanted to attend could not come, and that many others who were able to come have had to return to Tibet under strict deadlines,” Karma Gelek said. In a bid to reduce attendance at this year’s ceremony, Chinese officials moved beginning in November  to confiscate the passports of Tibetans authorized to travel abroad, at the same time ordering Tibetans already present in India and Nepal to return home. Speaking at the end of December to Tibetan pilgrims in Delhi, India, the Dalai Lama assured those ordered home that he would keep them in his prayers, according to a 28 December 2016 report by Tibet’s government in exile, the India-based Central Tibetan Administration (CTA). “Distance cannot dampen the sacred ties between a lama and a disciple. You can all pray from the far-flung areas in Tibet and I assure you that you will receive the Kalachakra empowerment,” the Tibetan spiritual leader said, according to CTA. “From the Kalachakra ground, I will keep the Tibetans inside Tibet in my deepest prayers,” the Dalai Lama said.